Listen to the interview with the authors on BBC Radio Oxford (24/11/16) starting at 1 hour 41 minutes and ending at 1 hour 49 minutes. Authors' blog post as featured in Washington Post article: settling a tired Virginia House race by drawing a name? Not that weird by history's standards. You'll be £19.99 closer to your next £10.00 credit when you purchase A Right Royal Scandal. What's this? 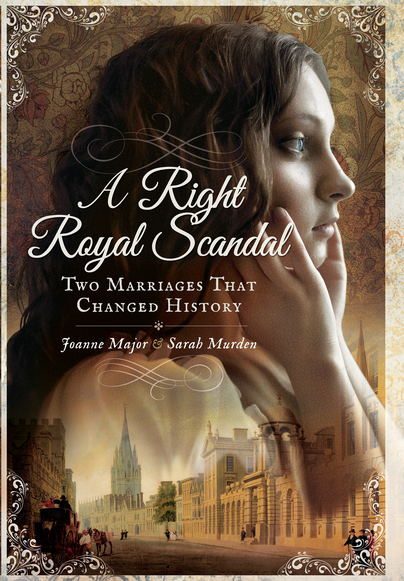 Almost two books in one, A Right Royal Scandal recounts the fascinating history of the irregular love matches contracted by two successive generations of the Cavendish-Bentinck family, ancestors of the British Royal Family. The first part of this intriguing book looks at the scandal that erupted in Regency London, just months after the Battle of Waterloo, when the widowed Lord Charles Bentinck eloped with the Duke of Wellington’s married niece. A messy divorce and a swift marriage followed, complicated by an unseemly tug-of-war over Lord Charles’ infant daughter from his first union. Over two decades later and while at Oxford University, Lord Charles’ eldest son, known to his family as Charley, fell in love with a beautiful gypsy girl, and secretly married her. He kept this union hidden from his family, in particular his uncle, William Henry Cavendish-Scott-Bentinck, 4th Duke of Portland, upon whose patronage he relied. When his alliance was discovered, Charley was cast adrift by his family, with devastating consequences. A love story as well as a brilliantly researched historical biography, this is a continuation of Joanne and Sarah’s first biography, An Infamous Mistress, about the eighteenth-century courtesan Grace Dalrymple Elliott, whose daughter was the first wife of Lord Charles Bentinck. The book ends by showing how, if not for a young gypsy and her tragic life, the British monarchy would look very different today. Here we have the tale of two juicy 19th-century scandals, both concerning the aristocratic Cavendish-Bentinck family. Shortly after the Battle of Waterloo, the widowed Lord Charles Bentinck eloped with the married niece of the Duke of Wellington – then, of course, the great military hero of the age. A case for ‘criminal conversation’ and divorce followed before the subjects of the scandal married. The couple’s eldest son Charley became the subject of the second scandal, two decades later, when he married a Romany girl in secret. The Cheshire connection? Georgiana Cavendish-Bentinck, half-sister to Charley and illegitimate granddaughter of King George IV, had her own moment of public shame in the bankruptcy court before retiring to a cottage at Cholmondeley Castle where she died, still debt-ridden, in 1883, to be buried in Overleigh cemetery, Chester. While the tone and language of the book may not suit some hardened historians, Major and Murden keep their text entertaining and light throughout, making for an easy read of a subject that keeps you engrossed from start to finish. This book is brilliant for those who enjoy the scandals of historical television, with the added authenticity of historical fact. It has been a pleasure to read about the life of Anne Wellesley, daughter of Lord Wellesley and niece of the 1st Duke of Wellington, who left an unhappy marriage to be with the man she loved. A fascinating family tale is revealed through the adventures of her son by her second marriage, Charley, who marries a gypsy girl before becoming a successful vicar. Through Charley, the two authors brilliantly track the family all the way to the Queen Mother. A fascinating story and amazing to read a families history which has until now been lost and is revealed here for the first time. I would recommend this book to anyone with a love for regency history and family biography, a delightful read. A Right Royal Scandal investigates the history and consequences of two nineteenth-century haut ton marriages that broke all the rules. The first half of the book tracks the story of Anne, Lady Abdy, the Duke of Wellington’s married niece, who ran off with Lord Charles Cavendish-Bentinck, younger son of the Duke of Portland. The second half of the book deals with Anne’s son, Charles Bentinck, known as “Charley”, and his marriage to a gypsy named Sinnetta Lambourne. This last not only brought yet more scandal on the family, but also threatened to derail the course of modern royal history. Charley and Sinnetta were equally well-drawn, and their heartbreaking story was evocatively depicted. Sinnetta’s plight, existing neither in the gypsy world nor in her husband’s aristocratic circles, was wonderfully explained: little details like her trying to whiten her own skin to fit in better were particularly sad. It is a very relevant story to the present day, a cautionary tale for the twenty-first century to remind us that in many respects we are not so very different from our Victorian ancestors after all. The reason for the intriguing title is not discovered until the very final chapters of the book, but I will not spoil it for readers by giving it away. This excellent, heartfelt and touching read is highly recommended for anyone with an interest in the nineteenth-century British aristocracy. half-sister, was known in the family as Hippo, probably a reference to her obesity. By following her progress we learn of her sad spinsterhood and chaotic finances. It’s a vivid picture of the life of a high-born misfit. More Regency revelations! This is most definitely not the world described by Georgette Heyer! Another superb work of history penned by two people - I suppose a nonfiction book might be easier for two people to write than would a work of fiction... that's not important. This time, the authors, Joanne and Sarah, uncover an intriguing tale of someone quite specific in Regency London. On second thoughts, it could have been written by Georgette Heyer... Enthralling stuff! If Prince William ever becomes the subject of the popular TV series “Who Do You Think You Are” then I strongly recommend the programme researchers contact Joanne Major and Sarah Murden, co-authors of this riveting biography of two generations of his ancestors, the Cavendish-Bentinck family. The biography reads like a saucy Regency/Georgian novel with love affairs, mistresses, illegitimate offspring, elopements and unsuitable (and unhappy) marriages galore. A golden thread weaves through this colourful tapestry of indiscretions leading us from the Battle of Waterloo to the present day, from the Duke of Wellington’s niece to our very own Prince William. So many interesting stories are packed into this book it’s hard to choose just one, but my own hero is Prince William’s great great great grandfather Rev. Charles (Charley) Cavendish-Bentinck, by all accounts a lovely, gentle, man, popular with his parishioners and liked by everyone. Charley’s mother was the niece of Duke of Wellington, and was considered flighty, strong willed and rather selfish. Comfortably married and seemingly settled she had scandalously eloped with her lover, Lord Charles Cavendish-Bentinck, a friend and confidant of the Prince Regent. After a very public and messy divorce from her first husband the two married and Charley was their second child. Charley’s father died when he was nine and his mother parcelled him out around family and friends while she ‘travelled’ the continent. Charley’s career was pre-determined, he was to become a clergyman and expected to take over a lucrative ‘living’ in the gift of his uncle the Duke of Portland. But this was not to be. When young Charley went up to Oxford to study he fell passionately in love with a beautiful young gypsy girl and they secretly married. They kept their marriage from his family for six years, but when Charley eventually confessed the family was horrified. His gypsy wife, Sinnetta, was considered most unsuitable. Sinnetta’s mother was true gypsy, while her father was a horse-dealer who fought drunken bare-knuckle fights and eventually died in a lunatic asylum! Poor Charley was banished from the family and the ‘living’ given to his brother-in-law. Charley was finally ordained a priest and through the patronage of the Duke of Bedford (who seemed not to care about Sinnetta’s gypsy connections) the young couple lived comfortably and relatively happily, liked and respected by everyone who knew them. Three sons were born to Sinnetta and Charley but tragically none lived beyond a few months. The beautiful Sinnetta died young and Charley was left alone, mourning her for many years. Accepted back into the fold by his aristocratic family, the lonely Charley found happiness again in a second marriage. He fathered three girls but sadly he died when the oldest, Cecilia, was just three years old. He did not live to see his daughter Cecilia marry Claude Bowes-Lyon, later Lord Glamis and Earl of Strathclyde. He would have been a wonderful grandfather to her brood of children and would have been so proud when the youngest, Lady Elizabeth, married Prince Albert (Bertie) Duke of York, later to become King George V, the father of our present Queen. There are many more fascinating stories in this extraordinary book, but I must mention Charley’s half-sister Georgiana, known affectionately as ‘Hippo’ to the family, whose grandfather was reputed to have been the Prince Regent and whose Grandmother was the infamous courtesan Grace Dalrymple Elliott - but that’s another story! Buy it, read it, you won’t be disappointed – a true 5* gem of a book! Murden and Major do well in bringing the Georgian era, and some unusual lives, to vivid life. It was so hard to put this book down. This book is a must-read book. For anyone who loves romance and drama. What kind of scandals lurk in our Queen's past? What do the love stories of the Cavendish-Bentinck family have to do with her? The answers can be found in this delicious account of two marriages that shocked society in the Georgian and Victorian eras. These were the marriage of Lady Anne Abdy, the Duke of Wellington's niece, to Lord Charles Bentinck, the son of the Duke of Portland, and his son's marriage to a beautiful gypsy girl. When the imperious Lady Abdy ran away from her dull husband with the rather impecunious but handsome and charming Lord Charles Bentinck, her relatives were horrified. Her husband actually sued Lord Charles for Criminal Conversation, and she had to endure financial hardship and all sorts of problems. It is sometimes a bit difficult for the reader to be sympathetic with Lady Anne, however, because of her fiery temper and the extremely high-handed way in which she treated her servants. Handsome young Charley Cavendish Bentinck had a bright future ahead of him when he went up to Oxford in 1837 to study theology. This was threatened when he met a captivating and beautiful gypsy girl who came from a rough and ready working-class world. The gypsies were regarded as exotic at best and thieves and criminals at worst. When Charley's relations found out about his secret wedding, there was all hell to pay... Could such a match last? I loved reading this book and it certainly made me want to read more about this distinguished family. I will read Fortune's Sisters again about the sisters who fell in love with the Wellesley brothers. This reads like a gossip column version of history where women had “fallen pregnant” and being called a “gilt potato” was not very nice. A Right Royal Scandal tells the stories of several couples lives and the society around them. It’s very entertaining, but also very interesting. This was a really good look at changing times between Georgian and Victorian eras. In particular, the changing norms and values of the upper class with regard to marriage and divorce. The writing is very colourful and illustrative. This is the kind of history book that could get boring rather quickly with all its detail, but instead I was glued to the pages. Very good. Crazy, wild, and all true- it's amazing the way aristocrats lived a few hundred years ago. Joanne is Lincolnshire born and bred. Originally from the north of the county, she now lives in a village to the south of Lincoln where she happily spends most days half in the present and half in the Georgian era, with an occasional foray into the world of the Victorians. A genealogist of 25-years standing, Joanne, together with Sarah, became distracted from the people she was researching and stumbled accidentally into the path of an eighteenth-century courtesan. Life hasn’t been the same since. 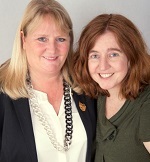 Sarah was living in Hampshire when she first met Joanne via an online genealogy forum. Sarah is slightly more of a ‘nomad’, originally from Nottinghamshire, then moving to the Peak District where she lived for over 20 years, followed by Hampshire for 12 years, she now enjoys the quiet life in a small village in rural Lincolnshire. Having studied Humanities but focusing mainly on history, Sarah has a passion for the eighteenth- and nineteenth centuries and could quite happily have lived in the eighteenth-century (only if very wealthy of course!). Together with Joanne she is the joint author of these compelling biographies, the two brought together through their shared passion for history and genealogy. Joanne and Sarah share a blog, All Things Georgian, where they publish twice weekly with a wide remit of writing about ‘anything and everything’ connected to the Georgian era. Expect everything from extra and exclusive information relating to their biography to articles about false bums and tums (fashion victims are nothing new!) and local murder mysteries. If it grabs their attention, then they hope it will interest their readers too. Nothing is off limits!